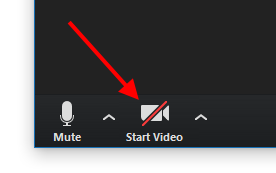 Here are instructions and tips for adjusting your video settings during your videoconference if you are using our Zoom platform on a Mac or Windows computer. Your default camera should automatically be selected when the meeting starts, but you can change this device if you have multiple camera devices. 1. Click anywhere on the video window so the menu panel appears at the bottom. 2. Click on the arrowhead to the RIGHT of the video camera icon, and a list of all detected cameras will appear. Click on the camera you would like to switch to. 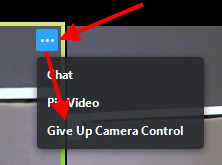 If you do not see a video camera icon with "Start/Stop Video" underneath it, no camera driver was detected for your computer. 2. Click on the camera icon to toggle between enabling and disabling the selected camera. 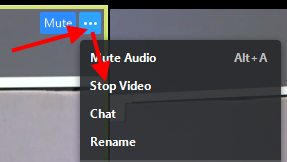 If you see "Stop Video", that means your camera is currently turned on (image on the left). 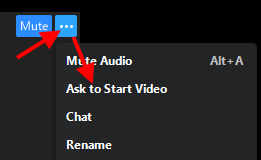 If you see "Start Video", that means your camera is currently turned off (image on the right). If you do not see a video camera icon with "Start/Stop Video" underneath it, no camera driver was detected for your computer. If you see "Stop Video" but only see a black screen where your video should be, another application may be using your camera device. 1. 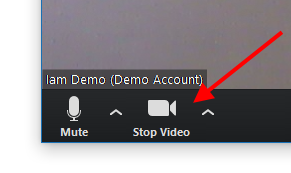 Click anywhere on the video window so the menu panel appears. 2. In the upper right hand corner of the screen, click on the icon of four arrows going outward to fullscreen, or the icon of four arrows going inward to exit full screen. This will shrink the video windows down to the small box that displays the active speaker. To un-minimize your video window, move your cursor over the small box and click on the icon that looks like a box with an arrow coming out of it (left). 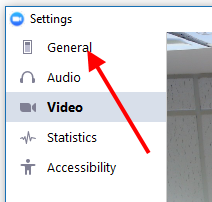 If you've minimized the video window and removed the displayed video, you'll only see the toolbar, but it will still have the option to exit minimized video (right). 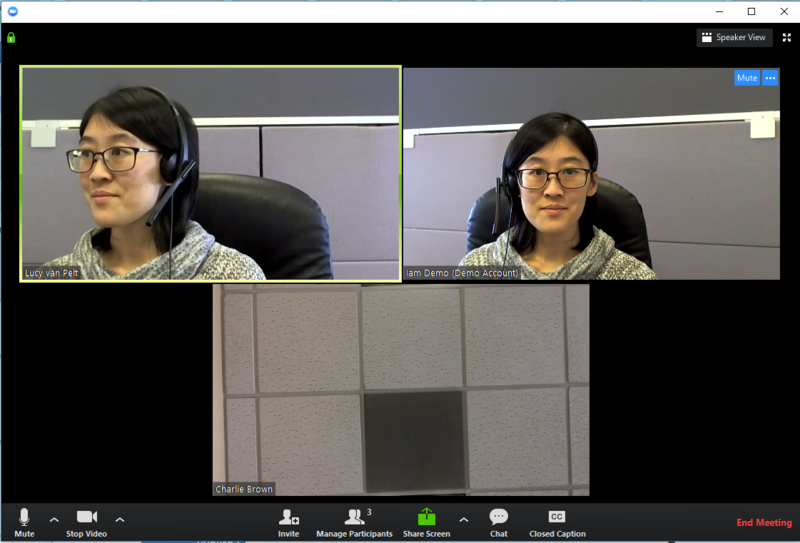 Speaker View is the default view for a videoconference--it shows the participant actively speaking as a large video window, and all other participants are in smaller video windows gathered at the top of the application window. Exception: you will not appear as Active Speaker for yourself. When you speak, the Active Speaker will appear (on your screen) to be the last person that spoke, rather than show a large video window of yourself. If you are on Gallery View and want to change to Speaker View, click anywhere on the video window, and then click on the "Speaker View" button that appears in the upper right hand corner of the video window. Gallery View shows all participant video feeds the same size as one another. If you are on Speaker View and want to change to Gallery View, click anywhere on the video window, and then click on the "Gallery View" button that appears in the upper right hand corner of the video window. To hide yourself, click anywhere on your video window (the one showing yourself), and then click on the three dots that appear in the upper right hand corner. Select "Hide Myself" from the menu that appears. To unhide yourself, click on any other participant's video window, and then click on the three dots that appear in the upper right hand corner. Select "Unhide Myself" from the menu that appears. If you are in a group session and would like to be able to always see one person's video as large, and the other participants as smaller windows, you can pin that person's video window to your screen. This will not affect the view for anyone else in the session. To pin a video window, click anywhere on their video window (the one showing the participant you want to pin), and then click on the three dots that appear in the upper right hand corner. Select "Pin video" from the menu that appears. If you are on Speaker View, switch to Gallery View first. To unpin a video window, click on the "Unpin Video" in the upper left hand corner of the pinned video. If another participant has a PTZ camera, you can request remote control of it. To request control, click anywhere on their video window, and click on the three dots that appear in the upper right hand corner. 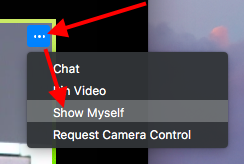 Then select "Request Camera Control" from the list that appears. The participant will see a request message, and must click "Approve" to grant you access to their camera. You will automatically change to speaker view, and camera controls will appear on the video window. If you would like to stop controlling the camera, switch back to Gallery View, and then click anywhere on their video window. Click on the three dots that appear in the upper right hand corner, and select "Give Up Camera Control". There are different general settings that you can edit for yourself. 2. Click on the arrowhead to the RIGHT of the video camera icon, and then click on "Video Settings". 3. In the window that appears, click on the "General" option in the upper left hand corner. 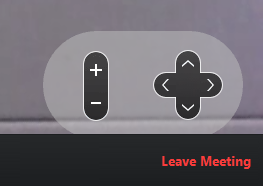 Confirm with me when I leave a meeting: controls whether or not the confirmation message appears when you click "Leave/End Meeting". Use dual monitors: this will display your video session in two duplicate windows instead of a single window. Side-by-side Mode: enables you to view shared screens in side-by-side mode. There are different general video settings that you can edit for yourself. Camera: this will show your selected camera, with a drop-down menu to allow you to choose other cameras. Enable HD: enable High Definition video; selected by default if supported by your camera. 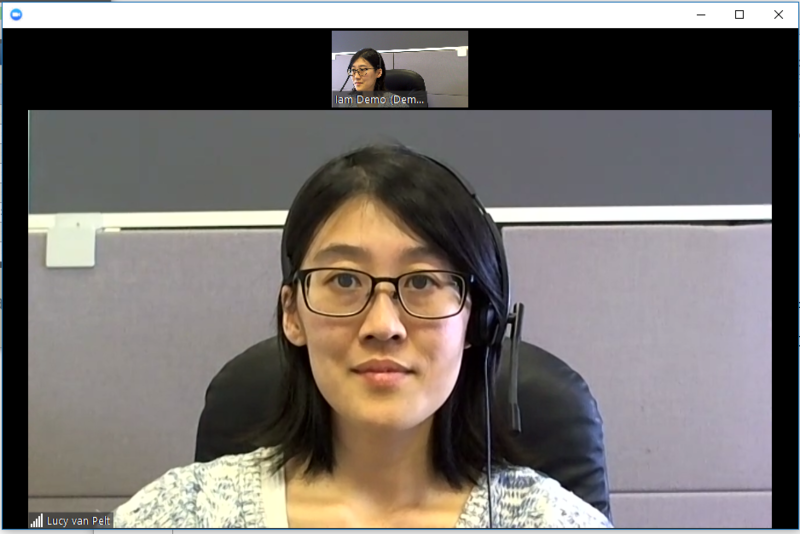 Enable mirror effect: allows you to view your video feed as if looking into a mirror. Does not mirror your video to other participants. You can view all keyboard shortcuts within the Zoom application. 3. In the window that appears, click on the "Accessibility" option in the upper left hand corner. Windows: You can also use the Alt key to show/hide meeting controls instead of clicking. Closed Caption Font Size: Slide scale to the desired size. Only has an effect if host has enabled closed captioning, and assigned a participant to type captions as the meeting occurs. 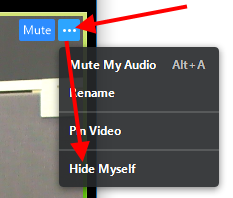 To mute or unmute a participant, click anywhere on their video window, and click on the "Mute" (or if already muted, "Unmute") button that appears in the upper right hand corner. If you would like to prevent the participant from un-muting themselves, you can disable that setting. 1. Click anywhere on the video window, and then click on the "Manage Participants" button that appears along the bottom. 2. 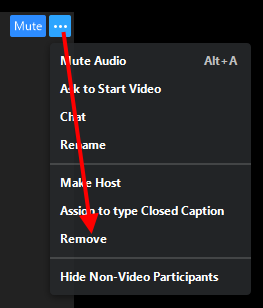 When a new panel appears, click on the "More" option in the lower right hand corner, and then make sure that "Allow participants to unmute themselves" is not checked. As the host, you have the ability to turn off the camera for other participants. (The participant will not be able to turn their camera back on unless you enable it. 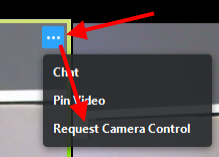 To disable a participant's camera, click anywhere on their video window, and click on the three dots that appear in the upper right hand corner. Then select "Stop Video" from the list that appears. To re-enable a participant's camera, click anywhere on their video window, and click on the three dots that appear in the upper right hand corner. Then select "Ask to Start Video" from the list that appears. The participant will see a pop-up appear asking them to start their camera. If they choose "Start My Video", the message will go away and their camera will turn on. If they choose "Later", the message will be dismissed without the camera turning on. To rename a participant mid-meeting, click anywhere on their video window, and then click on the three dots that appear in the upper right hand corner. 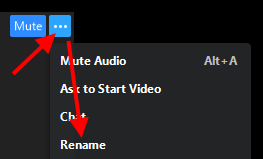 Then select "Rename" from the list that appears. If you are in a group session (3 or more participants including yourself) and would like ALL participants to be able to always see one person's video as large, and the other participants as smaller windows, you can set a spotlight on that person's video. As the host, only you will be able to set or remove a spotlight. To spotlight a person, click anywhere on their video window, and then click on the three dots that appear in the upper right hand corner. 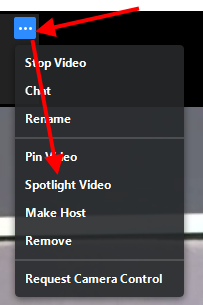 Then select "Spotlight Video" from the list that appears. 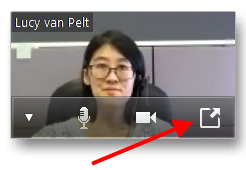 If you are on Speaker View, the three dots will appear on the person's video window at the top of the application window. Or, switch to Gallery View first. To remove the spotlight from that person, click on the "Cancel Spotlight Video" button in the upper left hand corner of their video window. You can make another participant host of the session, and they will have additional privileges. To make another participant the host, click anywhere on their video window, and then click on the three dots that appear in the upper right hand corner. 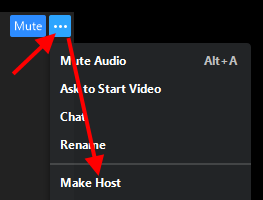 Then select "Make Host" from the list that appears. 1. They can transfer the host role back to you with the same steps, or you can reclaim it. Click anywhere on the video window, and then click on the "Manage Participants" button that appears along the bottom. 2. In the panel that appears, click on the "Reclaim Host" button in the lower right hand corner. If you want to prevent additional participants from entering the meeting, you can lock it. 2. When a new panel appears, click on the "More" option in the lower right hand corner, and then select "Lock Meeting". 3. If new participants try to enter the meeting, they'll see a notification that the meeting has been locked by the host. If you want to disconnect a current participant from the session, you can. However, unless you also lock the meeting afterward, they can just re-enter. 1. To remove a participant, click anywhere on their video window, and then click on the three dots that appear in the upper right hand corner. Then select "Remove" from the list that appears. This article was last reviewed by our Support team on April 26, 2018.